When should your characters notice and comment on something and when should it be just subtly included? Subtext is when something is going on in the story, but it’s only mentioned in passing, slantwise, or it’s just understood. Often, subtext comes out in dialogue, the unspoken things that the audience understands from knowing the characters and their relationship. But it can also be used in description. For example, I recently read a story about a Muslim high school girl. 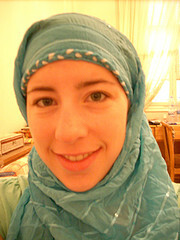 The author had pointed out on the first page that the girl wore a hajib, the traditional head covering. Of course, it’s appropriate and of course, the reader needs to know this information. But how to convey it? The point of the story is how a Muslim girl gets along in high school, so it’s fine to point this out on the first page. But, is it best? Should this first person narrator mention it directly? Would she mention it? Maybe. But maybe it would be better to slip it in sideways? How to do that? The story starts in a chemistry classroom with the teacher talking about safety in using the bunsen burner. What if the hajib had a long tail, similar to a long scarf? Then, the character could just casually throw that scarf part over her shoulder for safety’s sake. Job accomplished. We see the scarf and understand her religious affiliation. That accomplishes the same thing as telling about the character’s clothing, but it does it casually. The head covering is a natural part of the story, not introduced in an overt way.